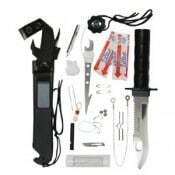 What do you need in a post-apocalyptic zombie survival situation? 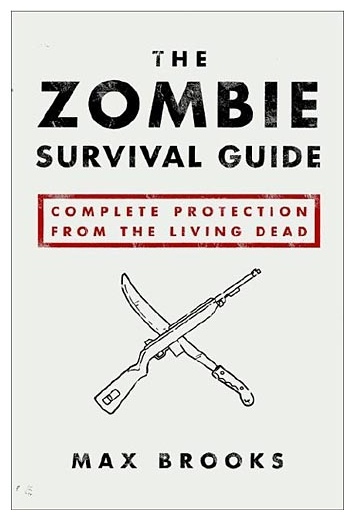 Well, actually, having a survival kit for any emergency also provides most of the material needed in a zombie-based situation. 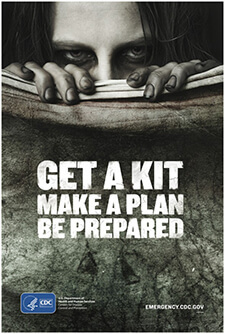 Check out the CDC emergency preparedness page and the individual kit page for survival kit inventory. You can build your own survival kit that is customized for your group and make sure to include a first-aid kit (that includes anything necessary to meet the medical needs of your particular group, in addition to the staples of a good kit), plenty of bottled water, and food for your group (keeping in mind any dietary restrictions of group members, such as those with diabetes). 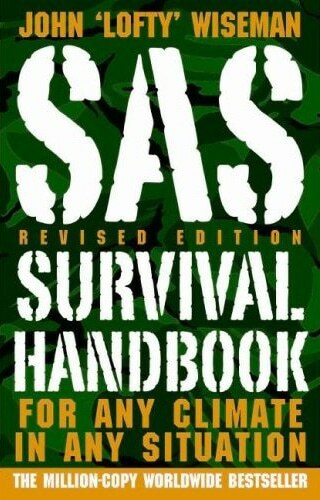 Everyone has a skill that will be useful in a post-apocalyptic world, so the first step is figuring out what that is. For some, it might be sewing by hand (which is useful not only for actual sewing and clothing repair, but could be used to help trained medical professionals if a great deal of people need stitches at once) or the ability to make a tasty meal with minimal ingredients and equipment. 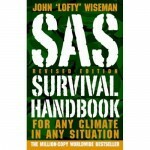 For others, it might be more literal survival skills, such as navigating the wilderness, identifying edible plants, and/or collecting safe water. Of course, in a post-apocalyptic world, the people with medical training will be sought for assistance only after those with actual military backgrounds. While doctors, nurses, veterinarians, medical technicians, and even certified nursing assistants have a special value in the post-apocalyptic world, anyone with medical training will be highly valued. Taking classes in first-aid (including CPR) can go a long way to making one a useful part of their zombie apocalypse survival group—and can offer the chance to save lives, even in pre-apocalypse disasters. The Red Cross offers low-cost classes for first-aid, CPR, and AED certification in most areas of the United States throughout the year. Everyone who saw Zombieland (2009) knows that the #1 rule in the zombie apocalypse is cardio, because outrunning zombies can be hard work. However, a survivor cannot live by cardio alone. To avoid pulling a muscle, it’s important to stretch often (since the post-apocalyptic world doesn’t always allow for a warm-up period before running for one’s life). 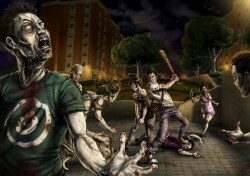 Running from zombies is likely to require frequent sprints, rather than long-distance running at lower speeds. Of course, running isn’t everything. It’s reasonable to assume zombies won’t be able to climb—or, if they can, that they’ll do so clumsily. Being able to climb quickly (and safely) up fences and other common structures can provide respite from running when one is pursued. Practicing this in the pre-apocalyptic is a two step process: first, strengthening one’s arms via weights and/or pull-ups; second, practicing climbing in a controlled environment, such as on climbing-specific equipment in the gymnasium or at a rock-climbing facility. I) The creature is non-autonomous (having been made such by an outside source or condition, whether or not the origin is known) and with a compulsion that drives the creature to act in a way its formerly autonomous self would not have acted. II) The creature’s appearance is altered in some way due to the condition—whether this is minor (such as expression or eye color) or major (such as decomposition of the flesh). a. Shamblers (example: George A. Romero’s original works, including Night of the Living Dead  and Dawn of the Dead ) – These slow moving, decomposing creatures reanimate after death … sometimes, long after (such as those that come through the ground in a graveyard). They have normal to slightly less than normal human strength, are displeasing to the olfactory sense (mostly due to being in the process of actually rotting), and typically eat their entire victim (not focusing on one particular area of the body). b. Fast-movers (example: the Resident Evil series) – This group of the undead is particularly dangerous because they are not only infectious, but they’re moving at or beyond normal human speed. Typically, this particular batch are the result of viruses (lab experiments gone wrong, or attempts at bioweaponry), and are more aggressive than their shambling counterparts. c. Talkers (example: the Return of the Living Dead series) – While most zombies are busy moaning, this particular sub-set speak. Some are more talkative (and intelligent) than others, a factor often influenced by the length of time the body has been in the state of death/undeath. Faster than shamblers, this group typically moves at typical human speed (sometimes slower, depending on injuries to the body) without having abnormal/accelerated velocity. This group has a higher “creepy” factor than the others, as the zombies most closely resemble their prior human counterparts (because of speech)—especially in time immediately following reanimation. d. Infected, Not Zombies (example: 28 Days Later and its sequel) – Creatures that become infected with a disease/virus making them seem zombie-like, but are not in the act of being dead prior to being in the act of being a zombie. While these are dangerous and contagious beings, they are not actually zombies.